Witch Hazel is actually a hydrosol and not a true essential oil. Hydrosols are the product of steam distilling plant matter to obtain it's oils. This shrub like tree does not however produce enough to make oil production worthwhile so you can only obtain the hydrosol. Hydrosols contain all of the same nutrients and properties of an essential oil, the only difference is they are not as concentrated. Used medicinally through out history, this is one of nature's gifts that you will find a million uses for. Of course it comes with the bonus of being natural and safe! Origin and Description: Native to North America this small tree was used by American Indians for medicinal purposes through out history. Sometimes also referred to as a bush it comes into bloom in late fall or early winter with either yellow, red or orange blooms. Part of Plant Used: The bark and leaves from the tree are steam distilled to produce a hydrosol. Aroma: A fresh, woody, herbacious scent. Skin Care Uses and Benefits: Witch Hazel is something you will always find a use for. It can be used for anything from rejuvenating tired looking skin to treating insect bites. It has anti inflammatory, antibacterial and antifungal properties making it useful when treating a variety of skin conditions. It is known to help treat psoriasis, eczema, insect bites, sores, bruising and swelling. Because it is a strong antioxidant and astringent it is effective in fighting the signs of aging. It can decrease bags under the eyes and reduce skin puffiness. If you have dry, tired looking skin it rejuvenates while reducing pore size and tightening and hardening skin tissue. This results in fresher, younger and firmer looking skin. If you suffer from acne it can remove excess oil, reduce redness and inflammation and help prevent further breakouts. Commonly used as an aftershave, you can also add it to facial masks, cleansers and astringents that you may already have, or add it to one of your favorite beauty recipes. 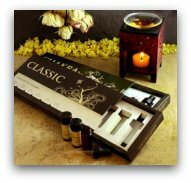 Blends Well With The Following Essential Oils: Blends well with any of the essential oils. Cautions:Avoid getting close to eyes. Can cause a mild irritation in some people so always do a test patch before use. If in doubt always consult your doctor.